As more sensors become connected to the internet, they're provided a unique digital identity. As the complex relationship between these M2M connected units evolve, space and time should be considered as key factors when analyzing data. Juniper says that costs will average close to the $1 sensor device objective throughout the forecast period. Their latest global study found that industrial and public services will post the highest IoT device growth over the forecast period, averaging over 24 percent annually. 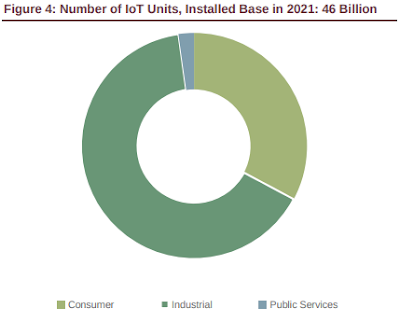 However, the analyst's assessment cautioned that both service providers and end-users will face tremendous challenges when considering IoT deployments at scale. "The platform landscape is flourishing," said Steffen Sorrell, senior analyst at Juniper Research. "However, analytics and database systems are, for the most part, not architected to handle the Big Data 2.0 era that the IoT brings." To that end, Juniper identified key areas where disruption is needed -- such as spatiotemporal analytics and intelligent systems able to run on less powerful machines (i.e. network routers). They've predicted that, without changes in attitude from some telecom service providers, getting an IoT project off the ground would be too difficult for customers that are not tech-savvy or self-sufficient. Juniper analysts now believe that initiatives such as the Exosite IoT Alliance and Rubicon Labs flexible business models (i.e. pricing according to the value of the data in question) would be fundamental in driving market development. Additionally, their latest research found that the IoT security threat landscape is widening. IoT distributed denial-of-service (DDoS) botnet attacks have become infamous in 2016 -- although in the medium-term, personal data theft, corporate data theft and physical asset damage will become the primary targets for IoT hackers. Enterprise and industry are investing heavily in security for IoT projects. However, the consumer market landscape is unprepared, with lax attitudes typified by the 'do nothing' Mirai Worm advice given to TalkTalk customers in the UK market. Moreover, the Juniper study also uncovered that greater government regulatory, corporate and media collaboration would be required, in order to improve the overall IoT threat landscape going forward.